I am craving salty and hearty meals these days. Yes, it's winter. But more so, I am in the final stages of marathon training. I've been logging in my longest long run of 35k last week. For several weeks I have been running 70-80k per week. Now it's taper time. Nothing more can be done to increase fitness, speed and endurance. The marathon will be in exactly two weeks. I have been training hard for 10 weeks. The last two weeks will be there to rest so I can line up at the start with fresh legs. Last year, I ran 3:35 at the Dubai marathon. For this year, I want to get close to 3:20. It's a very ambitious goal. I am convinced I can run under 3:30. I am pretty sure I can get close to 3:25. A time around 3:20 would be just awesome. Until last week, when I was still running big mileages, my hunger seemed pretty normal. Only now that I can sit back and relax, I seem to develop insatiable hunger pangs. I eat three muffins for tea, I finish off whatever is left on my kids' dinner plates. My handbag is full with snacks on the go, as I cannot be without food for more than 2-3 hours. As much as I try and keep animal products to a minimum, it doesn't work for me when I run a lot. I crave chicken, fish and eggs. They satisfy hunger, which would otherwise have me at the fridge all day long. Today's recipe fits the bill perfectly. 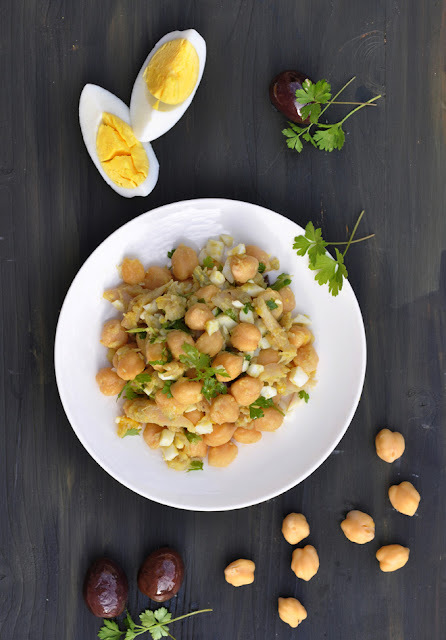 It's another Portuguese recipe that includes bacalhau (dried salted cod - remember - we brought several kilos to Dubai after our holidays in Portugal last summer), chickpeas, boiled eggs and parsley. It's so simple, yet so tasty. It's a popular summer salad in Portugal, perfect for potlucks and BBQs. And for marathon training refueling. Should I tell you that I had a hard time shooting the photographs of this salad, as I kept on eating the salad? Never mind sharing with other family members. Enjoy! 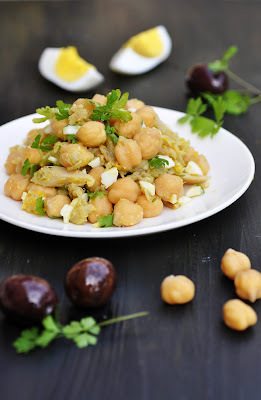 In a bowl, cover the bacalhau with water. Rehydrate for at least 12 hours. Drain and rinse the fish, then peel off the skin and remove bones. Flake into bite-sized pieces. In a pan, heat half a tablespoon olive oil over medium heat. Add the onions and fry until they become translucent. Add the bacalhau flakes and fry until cooked, another 4-5 minutes. Take off the heat and set aside. Finely chop the hard-boiled eggs. In a serving bowl, combine chickpeas and cooled bacalhau flakes. Gently stir in the chopped eggs and parsley leaves. Drizzle the remaining olive oil and vinegar over the salad and mix gently. Garnish with black olives and more parsley. Keeps well in the fridge for up to 48 hours. Serve cold or at room temperature.